Monday Makings… Life in the Crochet Lane!!! I absolutely love to crochet!!! If a day goes by without a hook in my hand… I feel sort of lost! So many of us talk about all our projects we are working on and how many we have stashed away… I am the Queen of that!! I thought I would take a moment to see if I could check some of those off my list this weekend… And the big answer was NO… I just decided to add more to my list…. Love to Crochet!!! So why start another Afghan while working on our CAL??? Yep that’s what I said to myself… I am donating this Beautiful Bright Sunburst Granny Afghan to a Fundraiser… It has to be done in just a couple of weeks… So I had to get busy!!! If you remember from last year… I made a Beautiful Cream and Scrap Sunburst Granny… I loved it so much that I thought I would make another!!! This pattern is from Priscillas Crochet… You can Click Here to get her Free Pattern!! Beautiful Cream and Scrap Sunburst Granny from Last Year…. Also this weekend~I worked on our CAL pattern… So much fun… I hope you are making it with me… If you haven’t started the CAL,,, It’s not to late to join in the fun…Week 1-3 are easy and you could catch up before we get to week 4… Lots of fun and lots of great stitching!!! A corner of my Week 3 CAL Afghan… So in love with Vanna’s Choice Yarn by Lion Brand!!! Crochet With Me!! Week 8 Crochet~Along…. You have a great eye for color. I would never have seen the possibility of the gorgeous afghan you made by only looking at the pattern square. I’m exactly the same way, SO many WIPs, and then start something new! Funny. LOVE your afghan-gorgeous! I love to crochet too! Happy Monday! Two very large projects on the go!! Your Sunburst Granny from last year is very beautiful! and I love the colours you have chosen to use on this years Bright Sunburst Granny! Such happy colours!! Thanks.. This is one of my very favorite patterns! Love the way yours turned out last year! I don’t see any where in the pattern from Priscillas Crochet to join the squares and I LOVE the way you did it! Are there instructions anywhere? I noticed there isn’t a number of squares listed, joining method or any kind of outer border on Priscilla’s pattern for this afghan. 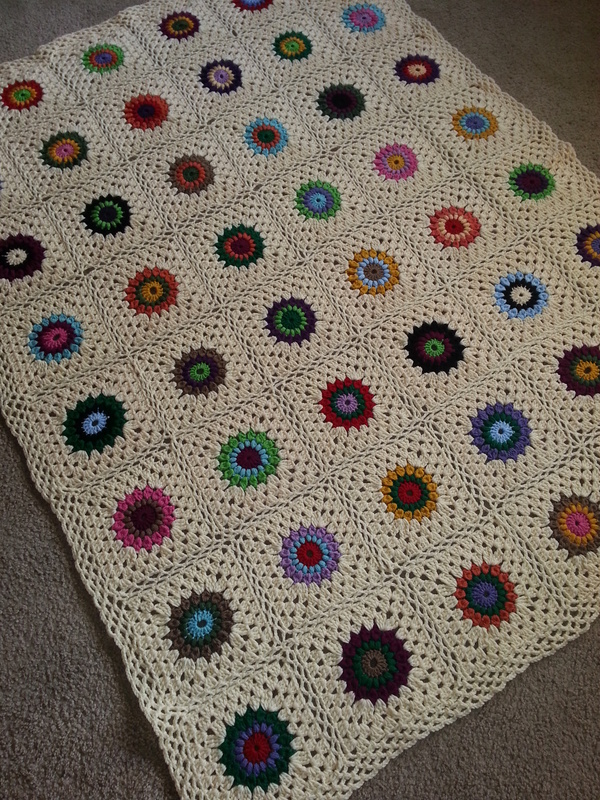 Normally I stay away from any square smallerr than 12 inches but this one is so pretty, I might try it. I guess the number, joining, & outer border is for the maker to decide. This might be good. If I get tired of small squares, I could finish it off with a huge border. I think it is wonderful you are doing this one as a fundraiser. It is so cheerful & it would go with almost anything. I bet it raises lots of money.